Ostriches are renowned for being the largest bird on the planet, but did you know that they are also known as one of the sexiest? It's true! It is hard to imagine a naughty French maid costume without the characteristic ostrich feather duster. At the height of the burlesque movement during the Roaring Twenties, Ostrich feathers were one of the most sought after accessories for dancers, thereby helping to create the indelible association of the bird with all things risqué. But Ostriches and Emus aren't just linked with rowdiness; these birds are also religious icons. Throughout much of ancient Egypt, ostrich eggs became a symbol of Life, Renewal, and Resurrection. The Ostrich is the totem animal for the goddess, Ma'at, the Egyptian goddess of Justice and Balance. According to the myth, an ostrich feather was used to judge the purity and worthiness of a soul. If the soul was found to be lighter than the feather, then he/she would be admitted into the Afterlife. However, any soul deemed to be putrid was banished to a "second death" from which there was no escape. The bird's connection with the spiritual realm does not end in Egypt. In the Christian tradition, ostriches are seen as symbols of the Resurrection of Christ. Ostrich eggs are prevalent during the Easter season and this accounts for why they are readily used to decorate churches and religious sites during this, most hallowed time in the Christian calendar. But most importantly, ostriches and emus are revered in the most arid parts of the world as vital lifesavers. Long before the days of ancient Egypt, hunters were known to carry pouches of hollowed out ostrich eggs as water canteens for long hunting trips and even to this day, ostrich eggs are valuable sources of food and nourishment on many low tech trips into the deep bush of the African wild. When it comes to "getting around", ostriches and emus also have their place in society. Even though they are not native to Australia, ostriches are usually used on the continent as a means of transportation. The birds are renowned for their speed and agility, and adrenaline seekers often ride ostriches in competitively for sport or quirky entertainment. Not a bad reputation for a bird from the desert. 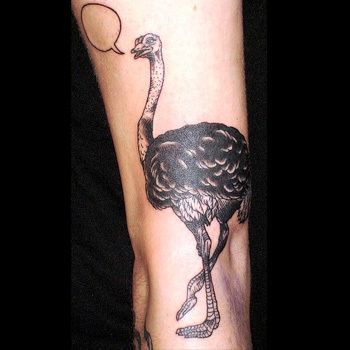 Although Ostrich and Emu Tattoos usually have a variety of background elements, the design of the bird itself very rarely strays far from its real life form. These designs are not among the more popular ones of the tattoo world, but with a little inspiration, they can be a truly unique piece of body art. When crafting a tattoo design, there are so many elements to think about. What will your new tattoo symbolize? Where will you place it on your body? What elements will you add to the design? It is a tricky endeavour, as such, it is always wise to get some professional help at this crucial stage. Our team of artists can bring their years of experience to your fingertips. Simply take advantage of our Custom Design Service and we'd be more than happy to help design a truly unique piece for you.